Torrey House Press, 9781948814058, 200pp. "Archaeologist Chuck Bender's contract for preservation work in Utah's Arches National Park is disrupted by a sudden death that turns out to be only the first of several. Where will it all end?" --KIRKUS "Masterfully plotted in confident prose, Arches Enemy is not only an adventurous and fascinating mystery you can't put down, it delivers important insight on ancestral cultures and their sacred lands. Only a truly gifted novelist is able to keep a reader turning pages while imparting extensive knowledge about the people, the landscape, and the park system. Scott Graham proves yet again that he is one of the finest." "A winning blend of archaeology and intrigue, Graham's series turns our national parks into places of equal parts beauty, mystery, and danger." A famed sandstone arch in Utah's Arches National Park collapses and takes a woman atop it to her death, ensnaring archaeologist Chuck Bender and his family in lethal questions of environmental monkeywrenching and political intrigue. As more deaths follow, Chuck and his wife Janelle race to uncover the killer even as they become murder targets themselves. 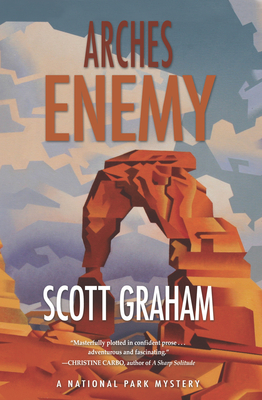 Scott Graham, winner of the National Outdoor Book Award, is the author of Canyon Sacrifice, Mountain Rampage, Yellowstone Standoff, and Yosemite Fall, books one through four in the National Park Mystery Series. Graham is an avid outdoorsman who enjoys mountaineering, skiing, hunting, rock climbing, and whitewater rafting with his wife, who is an emergency physician, and their two sons. He lives in Durango, Colorado.